(NOT QUITE-) MIDWEEK MIXTAPE – 27th May 2010! So, yes, this week’s Midweek Mixtape is a week late. But hey – there’s no merit in consistency, right? Especially when an institution as fixed as the calendar is involved. But compensation is still probably necessary – so this week the ANBAD New Bands Donkey is sporting a fetching mask in tribute to everyone’s favourite back pain victim Boneo from The U2’s. FIRST! Ton Spender is German, and may or may not spend money in increments of 100. Whatever his fiscal habits might be, his musical ones involve making downbeat techno that meanders between minimal and full-on crunch. Music like this fools you into assuming that it is a simple one-off buzz – though repeated listens reveal hidden nooks, crannies and reversed samples of hi-hats fed through a flange. SECOND! Chief took their name from the character played by Isaac Hayes in South Park, and formed a band in response to his ridiculous Scientology-led departure from the show. Oh, wait. Anyway – Cheif cook up (ho!) Big Songs that are surely pointing them towards Big Fame, and Moderate Fortune. No-one makes money from record sales these days. Lovely sleeve art. THIRD! Headtapes uses the power of his mind alone to record his bloopy music onto magnetic C90 cassette. He then uses his mouth to mumble quasi-pleasantries over the top. The resultant songs straddle the line between ludicrous and acceptable, which is quite a wide line if you think about it. FINALLY! Redtrack craft melodic, slightly labyrinthine power-pop songs. They are the second band in this mixtape who could feasibly hit the Big Time. This may affect your opinion of them, and so it should. But you ought to listen, because whilst a lot of you might equate Big Time Power Pop with The Kooks, this band are actually engaging, talented and un-punchable – a huge head start. Cigarette has a lovely, hesitant riff too. NO MORE! Really. 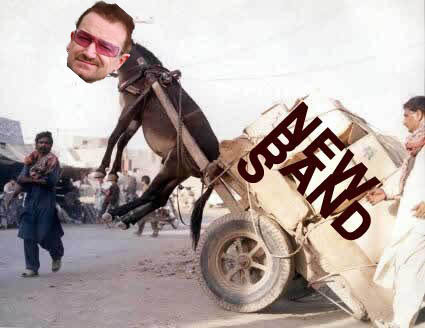 But just look at Bono’s head on a donkey. Look. Posted on May 27, 2010 by Joe Sparrow. This entry was posted in Headline, Today's New Band and tagged Midweek Mixtape. Bookmark the permalink.